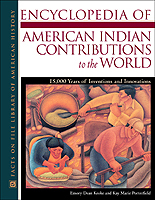 Encyclopedia of American Indian Contributions to the World is a unique A-to-Z reference to the vast offerings made by American Indians throughout history. More than 450 entries provide a panorama of little-known information about the rich inventiveness of indigenous peoples of North, Central, and South America. To be included in the book, the item must have originated in one of those three regions, have been used by Indian people, and have been adopted in some way by other cultures. While many of those contributions can clearly be shown to have been first invented or used by Indians, some entries cover inventions that were made independently by others as well. In these cases, the unique features of the American Indian science or technology are covered and compared to the other version of the item or process. Emory Dean Keoke, an enrolled member of the Standing Rock Sioux, has worked as a multicultural relations and communications consultant. He received a B.A. in Indian studies and a B.S. in nursing from the University of North Dakota. Kay Marie Porterfield is a writer with more than 20 years of experience. She received a B.A. in English and an M.A.Ed. in counseling. She is the author of numerous books, including several nonfiction books for Facts On File. Porterfield worked as a reporter for Indian Country Today, the largest Indian-owned weekly newspaper in the United States. She is the winner of a 1996 South Dakota Press Association Award and the recipient of a 2003 Artist Fellowship Award in creative nonfiction. "Wordcraft Circle Writer of the Year (Creative, Reference Work), 2002"